Whats New in SMB Tech? Internet (VoIP) Phones! 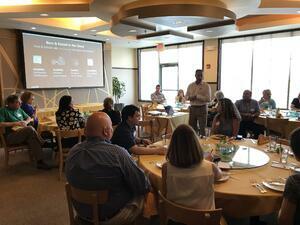 In case you missed it: Last week we hosted a technology lunch and learn event with our partner, Jive Communications. Local business owners enjoyed networking, lunch, and technology. Verizon is phasing out old copper phone lines, and if you have an old phone system, you may be in need of a change (even if you aren't excited about the latest and greatest features!). 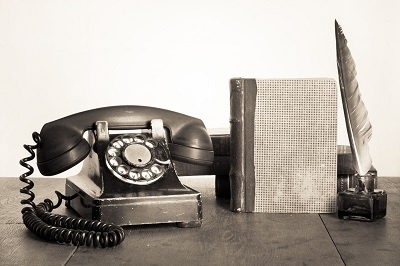 We still see SMBs with phone technology that's over 10 years old! If its been that long, its time for a change. One of our missions at Ekaru is to help SMBs get more from the technology you already have and to learn about the new technology you need to know about! Auto Attendants - You can add multiple Auto Attendants for your business at no additional cost. Call Queues - Instead of needing to do a rapid-fire "please hold" for multiple inbound calls, you can set the calls in a queue with a pre-recorded message (with an escape hatch to voicemail) and then pick up when you're free. Custom Schedules - Need to send calls to an answering service after hours - just program it in. Mobile App - You can send and receive phone calls with your office caller ID from your cell phone - bring your office phone anywhere you go! Hot-Desking - Get your customized phone settings to appear on another office phone. This is great if you have shift workers or mobile workers who work out of different offices. International Calling - Free calls to over 50 countries. Reporting and Call Analytics - What are your busiest phone times? How long are your average calls? How many calls go to voicemail. With a modern system, all the data is at your fingertips. These are just some of the features we discussed. For more information, check out the presentation slides. If you're already using the system, we recommend starting with a simple plan and then building in new features as you learn about them and how they may help your business. We've been using the Jive system for a few years and you can stop by our office to see the system in use, try a loaner phone, or get a full on-line demo. If you haven't looked at phone systems recently, we highly recommend that you check out Jive! Thinking about a New Phone System in 2017? It's a New Year - Are you tired of your old phones? If you haven't checked out phone technology recently, you'll be amazed with what's available! The lines between computer technology and phone technology have blurred. Instead of paying for multiple phone lines, you can run all your phones over your Internet connection (Voice over IP or "VoIP"), providing a lot more functionality at less cost. You also don't need a lot of complicated phone network equipment on site - just handsets connected over your regular office Internet connection. Does this look familiar? 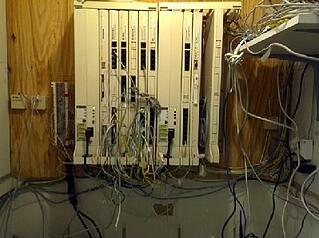 This is an old PBX system and if you see a lot of wires like this in your network closet, its time for a change. A PBX is a "Private Branch Exchange" which is the technology that enables incoming calls to be switched between all your handsets and extensions. Years ago, your office would have multiple phone lines coming into the PBX, and then multiple phone lines going out to each handset in your office... a lot of wiring! With VoIP, you may still have a PBX on site, but it will look more like a modern switch or router with network cables coming out of it. You also have the option for added flexibility now to have your PBX "in the cloud". There's a lot of hype about the cloud, but a PBX in the cloud is now mainstream, and a great cost-effective option for Small and Medium Businesses to have a low maintenance solution that also enables connecting remote users. Custom Schedules: Configure time-based call routing for open/closed business hours, holidays, and special events. Visual Dial Plan Editor: Map out call ﬂows visually and make changes on the fly using the drag-and-drop interface. Easily conﬁgure elements like wait times, auto attendants, voicemail boxes, sound clips, and schedules. Detailed Call Analytics: Create opportunities for more efficient use of resources, better training, and proper scheduling by using time-of-day reports, geography-based heat maps, and downloadable call detail logs. Mobile Operation: Use the mobile app to use your cell phone as an extension of your office handset. You can take your office wherever you go. Need to take office phone calls on a snow day? No problem. Remote Office: Remote workers can plug in a handset anywhere with an Internet Connection. It's easy to connect multiple office locations even if there's just one user. Want to schedule a demo? Call us at 978-692-4200 or send us an email.